Last sighted, the John Feathers map gift sat on the loading dock at Central Library in downtown Los Angeles: 220 cartons full of cartography, along with an entire moving truck packed to the rafters with all manner of atlases and maps of all shapes and sizes. There were, all told, some two football fields’ worth of library shelving for the street guides and fold-outs alone on this one mega-load. To refresh somewhat: John Feathers was an obsessive map collector who died unexpectedly and left behind a house in Mt. Washington, in Northeast Los Angeles County, where his collection had been stored, overwhelming the less than a thousand-square-foot cottage. There were maps in every conceivable location: in cupboards, in linen closets, in storage spaces under the house and even in piles where windows were discovered where no one knew they existed. As Feathers did not actually own the home and was only bequeathed the rent-free use for perpetuity, when he died unexpectedly what was in the house was unknown to those outside JohnnyMapps circle. The true heirs of the property (Marvin Keller and Esther Baum, octogenarian fraternal twin siblings of the original owner Walter Keller) were ignorant about any such map collection and were set to bulldoze the house with all contents headed for a damn big dumpster. As map luck would have it, the realtor who represented the property had strong librarian ties since his Mom was a library school professor, and he knew better than to trash an archive. This is where I came in, and by pure luck managed to get a fortunate phone call and the “house full of maps” for my institution. With the help of a small crew of library lovers who unloaded the mass in one single day and unloaded same on that lonely loading dock, we managed to move a mountain all at once. While there are photos of me lying on top of some of the box loads smiling, inside I was a little concerned. 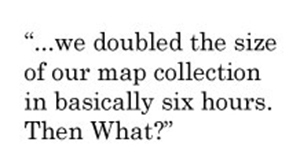 After all, on that day and in that big truck we doubled the size of our map collection in basically six hours. Then What? It would be nice to say to the WAML folks reading this bulletin who are used to order and good preservation that the thing is a fait accompli, but we are still running around with our hair on fire when it comes to finding the proper places for the mountains of stuff that still comes from the hastily packed boxes and crates rescued from the little house on Canyon Vista in Mount Washington. At first the boxes wandered about within my vast library, even stopping in a protected but stinky abandoned staff restroom on the lower levels of the building. From there, a series of volunteer projects took them up a floor to LL3 where the Deloitte Touche accounting firm sent us dozens of sharp minds on two full volunteer days who turned random into a sort of order, moving street guides onto shelves that fought for space with government documents in the Social Science department. This was rough sort number one, grouping street guides and atlases into broad geographical areas: Pacific Northwest, Far West, Midwest, the South, Northeast, Mid-Atlantic etc. While this might seem easy and logical, you must understand that many of the volunteers were not native to this country, and say Delaware might seem as recognizable to them as Madyha Pradesh or Turkana in the Rift Valley would be to us native Angelenos. There were many questions, but slowly the boxes were revealed for the jigsaw puzzles that they were. In the time the house stayed open after John’s death, there were a number of family members who stopped in and emptied out dresser drawers and useable boxes onto the floor of the house they assumed would be torn down. Thus, when the LA Public Library team showed up, the order that Feathers had maintained was mostly destroyed, making his cataloging system a big tossed salad of every map imaginable. Not to mention the frenzied stuffing of everything into boxes without concern for form or content on the the six hours of the great pack. Still they all sat together in cartons on the loading dock that sweaty December 15, 2012 waiting for the code to be broken and Alan Turing was nowhere to be found. Today, there are four main fields of battle: the wide open spaces of row 99 in the closed stacks of our Social Science area, my cubicle where the more rare and digitizable stuff sits on a truck, a cold room where the rolled up and impossible to shelve huge maps rest on a gurney and vertical file drawers where the California street guides are tidily organized. The library was never able to provided large staff assistance outside of a lone but powerful Messenger Clerk, so much of the scouring and sorting was done by myself and volunteers who sometimes worked hard and sometimes mostly looked at old maps. We had cute school girls from the local magnet who took lots of selfies and opened a dozen boxes, accomplished writers and archivists who dug in deep and hundreds who got excited by tours and made big promises…that didn’t quite turn out. The idea of volunteers running libraries kind of got a test in this process as the grand product of my more than twenty speaking engagements about the Feathers collection plus six radio pieces, two TV shots, a lengthy piece in the IMCoS (International Map Collectors’ Society) Journal, an astounding blurb and photo in the French GQ, a gig with the Los Angeles Magazine trumpeting such maps and an actual film have resulted in less than a half day of digging into the dusty materials with intent to bring order by the well-meaning map lovers of LA. There are exceptions however; writer Chuck Soter made progress in putting the state street guides into large categories, Cindy Gualpa tackled local boxes but had to return to school, and the Deloitte Touche Group, who may not have known geography as well as us but they worked hard, fast and efficiently, on one fine day last Summer managed to turn 75% of the jigsaw boxes into actual states and defined geographical areas. Bit by bit this delineation allowed much more streamlined sorting and allowed even the few hours of volunteers an easy and straightforward way to empty jumbled boxes and get them into order. By the next Deloitte visit this summer we should have all of the original 220 cartons organized into the 80 or so easily geographical scenes that will make retrieval of maps possible. At this time, plans are underway to build sets of vertical file cabinets that will hold both the street guides and fold out collections that filled many a box and crate in Mt. Washington. Yet, despite the fact that total strangers drive by me shouting encouragements as I take my morning constitutional around the Silver Lake Reservoir, there is much to be done. Then, there were the big guns, such as CJ Moon and friends. CJ Moon at 30 years of age has some challenges that affect his everyday life, dealing with high functioning spectrum of autism and profound hearing impairment. But his love for maps and intense dedication to Thomas Guides made him far more than a volunteer. CJ is not only a joy to meet and greet, his brain can see patterns that mine cannot, and his inventory of the entire, massive collection of street guides from all over the world is impeccable and was done in about a fourth of the time that a team of catalogers might take in tackling such a task. CJ, like another map collection favorite, 11 year old Greydon Massey, knows Thomas guides like no others. When CJ inventories the street guides he creates a spread sheet as he goes along, now kept at the reference desk in a bulging glossy folder with page after page of entries detailing editions of street guides from Thomas, Renie, Gillespie, Mapfax, Mapco and even Hagestrom from back East. His work will make cataloging possible when before it seemed the job of 10 catalogers for 10 years. Also collectors Brian Hatcher of the Road Map Collectors and map historian Curtis Carroll have helped in identifying and organizing groups of significant maps. Hopefully, in the near future there will be some kind of grant to provide the materials to get everything into drawers in the proper archival condition. All of the rare and pristine Gillespie, Renie and Thomas maps that Feathers collected are safely tucked away in drawers and are used in reference work, including some digitization that gives the world of the internets some glances at John’s treasures. As has been said elsewhere, he was not a collector of rare maps and those that might fetch tidy sums at auction, but the archive he collected certainly makes the work of a scuffling map librarian much easier. Genealogists might pine for a detailed map of Santa Rosa in 1947 or wish to trace old Highway 60 through California, and while the maps that answer these queries are in boxes and not cases, they still do the trick and make the patron mighty happy when we can provide what might have seemed lost. While we are just sorting we also are culling some of the more interesting examples of road maps, oil company maps, Road Atlases, chamber of commerce pictorials and cartographic siren songs to visit Los Angeles out and onto the scanners for internet treats. See http://www.lamag.com/author/glen-creason/ for a few treats that have emerged from the boxes dragged out of 491 Canyon Vista. While some doe-eyed local historians in LA ask “when will the collection be digitized” I can only remember a skeptic GIS expert telling me decades ago that historic layers on modern cartography would be impossible because it would take a “gig” of memory to store all that data, like he was suggesting this was like the equivalent of stuffing North America into a duffle bag. Certainly, there are dreams of digitizing many of the more rare and interesting materials, but turning 100,000 street guides into PDF files may not happen in my lifetime. Probably the most amazing thing about this entire project is that there are still maybe a dozen tattered white boxes that I have not even opened yet. Mysteries remain.